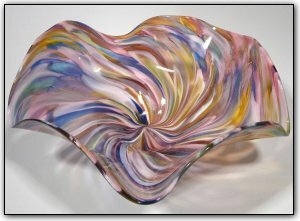 This fluted bowl was made from hand pulled canes of colored glass, which is a two-stage time consuming process. First Dirwood hand pulled the canes used to make this bowl, then he made the bowl using those canes. Finally a small amount of real gold adventurine was added to give the bowl its elegant gold sparkle. Make sure to zoom in on the photos to see it shine!